In many ways, the ProForm 505 CST is identical to the ProForm 400i, except the 505 CST has a slightly better build quality and a few different features. Some features we particularly liked on the 5” backlit display which was easier to use than the 400i as well as the console controls layout. The 505 CST also has a higher weight capacity than the 400i. The 505 CST falls into our Between $500 - $700 treadmill category, and we will be updating that page to bump the 400i from its spot as we tested the 505 CST and found it to be the better treadmill. The 505 CST retails for $999. While we wouldn’t recommend it at that price, it regularly goes on sale for $599, at which price we are comfortable recommending as a good budget treadmill. You can also use a promo code from ProformPromoCodes.com. Have budget constraints - If you want a quality treadmill from a treadmill manufacturer known for producing long-lasting treadmills but have budget constraints, then the 505 CST is a good option. Want a treadmill primarily for walking - When it comes to budget treadmills, their small motors and light frames aren’t up to much more than walking and occasional jogging. Users looking for just those activities would find the 505 CST a good fit. Need a compact treadmill - The 505 is a light and compact treadmill with a spring-loaded pin to secure the deck when folded. As a budget treadmill, the 505 CST is a good option for users to consider. However, it still is outmatched by the Horizon T101, which is our Best Buy for the Between $500-$700 category. 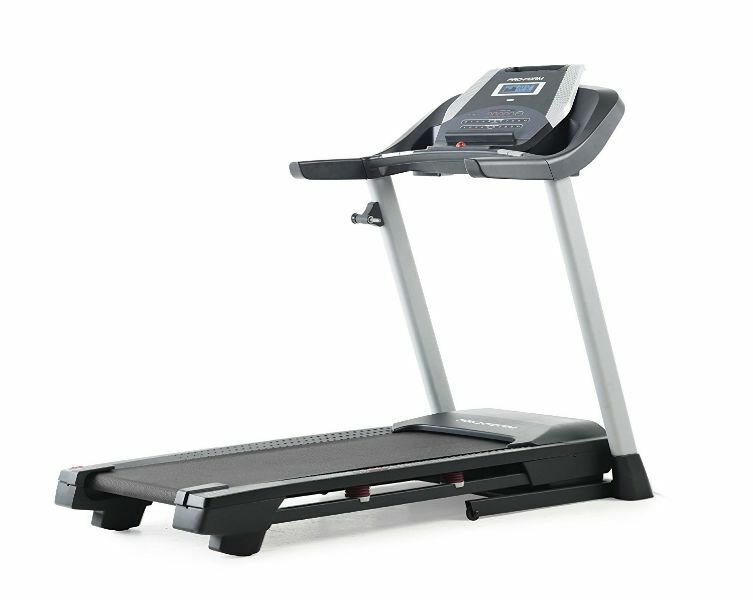 Average treadmill belt area for its price range - With a 20” by 55” belt, the 505 CST has the same belt area as other treadmills in its price range. Good weight capacity for a budget treadmill - Many budget treadmills can only accommodate users who weight up to 250-300 lbs. The 505 CST can hold a user who weighs up to 325 lbs. Decent build quality overall - Much like the ProForm 400i, the 505 CST is of only decent build quality. It is not the most stable when you workout at any speed over a walking pace as the console wiggles a lot. However, it does have a higher weight rating than the 400i, which helps the 505 CST move less than the 400i. While we liked the 505 CST for what it was — a good budget treadmill — it has restricted appeal as a piece of exercise equipment. Motor Size - For a budget treadmill, the 505 CST comes with a good 2.5 CHP motor. In this, the 505 CST outdoes the T101 as the T101 only has a 2.25 CHP motor. Running Area - Standard among cheaper treadmills is the 505 CST running area which measures 20” by 50”. If you are taller than 6’, you may find that length restrictive even for just walking. Weight Capacity - The 505 CST has a good weight capacity, being able to hold a user who weighs up to 325 lbs. Folding - We aren’t crazy about the 505 CST folding mechanic. Unlike many modern treadmills which have hydraulic locking systems, including most ProForm treadmills, the 505 CST requires you to use a spring-loaded pin to secure the deck of the treadmill when in the folded position. It is the not biggest flaw but it doesn’t compare well with even other budget treadmills. Space / Footprint - One reason people may choose an affordable treadmill is that they are generally more small space-friendly. The 505 CST in particular measures 36.5” wide, 73.5” long, and 61” tall. It also is light and has wheels so you can easily move this treadmill around if you need to pull it in and out of a corner for your workouts. Max Speed - The max speed of the 505 CST is 10 MPH. While most treadmills have a speed standard of 12 MPH, we don’t consider the lesser speed of the 505 CST to be much of a loss as it is meant primarily for walking. Incline - The 505 CST has an okay incline range, being able to go from 0% to 10% incline. Workout Apps - A fairly basic amount of workout programs come with the 505 CST. With 18 programs to choose from, you can select a workout focused on either calorie burn, intensity, incline or speed. If you want more workout options, the 505 CST is also able to sync up with iFit Coach once you purchase an iFit Coach membership. Display - A backlit, 5” display comes with the 505 CST. We prefer this over the 400i round display as the 505 CST display shows workout information more readily. It definitely has more of the look of other, more expensive ProForm treadmill consoles. Speakers - The two speakers are located on either side of the 505 CST console. Interestingly, the audio port is located in the upper device holder well at the top of the console. So there will be no trailing wires to get in the way of your access to the console controls as any device you plug in will be kept in the upper device holder well. Fans - Like the 400i, the 505 CST has no fans. As a walking treadmill, this isn’t a huge issue but it is certainly a downside to the 505 CST. Heart Rate Monitoring - Like many cheap treadmills, the only kind of heart rate monitoring on the 505 CST is the EKG handlebar grips. They aren’t very accurate when it comes to monitoring your heart rate. The build quality of the 505 CST is only of decent quality. Without a crossbar, the 505 CST console tends to wiggle quite a bit when you use it at a pace faster than a brisk walk. There are more plastic parts on this treadmill than other competitors’ treadmills, which means the 505 CST may not last as long. You have several options if you need to contact ProForm concerning the 505 CST. ProForm has a live chat option on their website, a phone line, and a customer support email. Also, the 505 CST comes with a 30-day money-back guarantee. There is a 10% restocking fee if you choose to return your 505 CST. If the product is damaged or defective on arrival, you can return the 505 CST without paying the restocking fee. With these qualities, we feel comfortable recommending the 505 CST as a decent option for those looking for a good walking treadmill. Currently, ProForm has the 505 CST listed as a limited time offer. This may indicate that they are planning to discontinue the 505 CST after this year. So if you are looking for a decent budget treadmill at a great price, then we recommend you purchase the 505 CST directly from the ProForm website.